Michael Thomas (DK – $8.600/FD – $8,300): Thomas slipped to fifth in WR scoring after posting two boring games (4/38 and 5/40). Over his last three games, Michael only has 13 catches for 170 yards and one TD on 18 targets. He dominated the Bucs in Week 1 (16/180/1) while delivering an impact game in Week 9 (12/211/1). Thomas has four games with ten catches or more while averaging 8.75 targets per game. Tampa ranks 30th defending WRs (163/2017/18 on 219 targets) with the most failure vs. WRs coming over the first seven games of the year (NO – 23/268/2, PIT – 20/200/2, CHI – 10/147/4, ATL – 19/278/1, and CIN – 15/219/2). The Bucs played well vs. WRs over the last five games (CAR – 8/93/1, WAS – 11/113/1, NYG – 8/115/1, SF – 8/131/1, and CAR – 13/186/1). Before last week, New Orleans scored 22 TDs over their previous four games. Brees and Thomas look poised for a rebound game while expecting at least five TDs. Michael did land on the injury report this week with an ankle issue, which appears to be minor. Davante Adams (DK – $8,400/FD – $8,700): Adams played well last week (8/93/1), which gives him 11 TDs in 12 games in 2018. Davante has four games with over 100 yards receiving (9/140/1, 10/132/2, 5/133, and 10/166). He averages 10.6 targets per game. The Falcons moved to 15th in WR defense after holding WRs to 39.0 Fantasy points or fewer over the last five games. From Week 2 to Week 7, Atlanta showed disaster downside vs. the WR position in each game (CAR – 16/223/3, NO – 15/177/2, CIN – 18/238/2, PIT – 11/140/3, TB – 17/273/1, and NYG – 14/321/1). The Falcons’ best CB lines up on one side of the field on most plays, which allows Adams to face the weaker Robert Alford on most plays. A nice matchup with 100+ receiving yards and a TD being his expected floor. DeAndre Hopkins (DK – $7,800/FD – $8,600): Over the last seven games, Hopkins has 41 catches for 521 yards and six TDs on 57 targets while Houston has only attempted 173 passes (less than 25 per game). DeAndre has over 100 yards receiving in four games while scoring eight TDs. In Week 4, he had a big game (10/169/1) against Indy. The Colts have the fifth best WR defense (132/1591/12 on 190 targets). The only team to have success at WR vs. Indy was Houston (26/340/2). CB Pierre Desir tends to minimize the damage while making most of his tackles. The Texans will get Hopkins the ball, and he should break his two-game scoreless streak. Volume WR (9.5 per game) who needs to the Texans to attempt more passes to post an impact game. Possible best play of the day with multi TD upside and over 100 yards receiving. Adam Humphries (DK – $4,900/FD – $6,500): Humphries has been very productive over his last six games (33/286/5 on 41 targets). Adam has a TD in three straight games and five TDs in his last five starts. His skill set points to a possession type WR with opportunistic value in the red zone. Over the last seven games, he averages 7.1 targets per game while being a nonfactor in his first matchup against the Saints (3/27). CB P.J. Williams will give up plenty of yards and TDs, which will lead to Fantasy owners looking to roster Humphries in the daily games in Week 14. A favorable matchup, but his higher salary may lead to better options at WR even with a very winnable matchup. Chris Godwin (DK – $4,900/FD – $5,600): Godwin was a very good value play in Week 14 (5/101/1), but he only received six targets. He scored four TDs over the first five games with one other game with over 100 yards receiving (7/103). As the fourth WR for the Bucs in Week 1, Chris caught three of his four targets for 41 yards and one TD. CB Eli Apple makes many mistakes in all areas, which invites another solid game by Godwin. The Saints will score in this game, and Tampa will need to throw. The game script vs. the Saints screams that the WR2 and WR3 matchup have upside. Double down here while New Orleans focuses on slowly down Mike Evans. Sterling Shepard (DK – $4,400/FD – $5,200): Shepard only has 16 catches for 130 yards and one TD with 25 targets over the last five games. His only three games of the value came in Week 3 (6/80/1), Week 4 (10/77/1), and Week 7 (5/167). Sterling landed on the injury report this week with a rib issue, but he turned in a full practice on Thursday. Washington held him four catches for 34 yards on eight targets in Week 8. CB Greg Stroman has plenty of failure risk in TDs and big plays if Eli decides to look his way. For the Fantasy owners that roster high salary RBs, Sterling has the right skill set and price point to pay off in Week 14. Tyreek Hill (DK – $8,000/FD – $8,200): Hill played great in Week 11 (7/117/2) and Week 12 (10/215/2), but Patrick Mahones failed to get on the same page with him on a couple of wide open long bombs. Tyreek finished with 50 yards with one catch on six targets. He has two other impact games (7/169/3 and 7/142/3) which both came on the road. Hill has also been a much better play on the road (43/752/9 on 64 targets in seven games) compared to at home (23/367/3 on 36 targets in five games). He averages 8.3 targets per game. The Ravens have the second best WR defense (132/1501/9 on 233 targets) with the Bengals’ WRs (12/168/4) and Browns’ WRs (17/218/1) having the best success. Mahomes will test this secondary in the deep passing game, and CB Jimmy Smith will be exposed in coverage. Against the grain player who plays his best ball in tough matchups. Kenny Golladay (DK – $6,400/FD – $7,200): Golladay landed on the injury report this week with a quad injury that appears to be minor. Over the last four games, Kenny caught only half of his 44 targets for 331 yards and two TDs while continuing to fall short of expectations. He has four playable games (7/114, 6/89/1, 6/78/1, and 8/113/1) in 2018 while averaging 7.7 targets per game. The Cardinals are 13th in the league vs. WRs (160/1862/12 on 241 targets. Only one team (LAR – 19/303) has over 200 yards at the WR position. Arizona held WRs to fewer than 200 yards in the last ten games. His date this week is with CB Patrick Peterson, which points to minimal upside. Josh Gordon (DK – $6,000/FD – $6,700): It’s showtime for Gordon supporters in the season-long games. Over the last six games, Josh has 25 catches for 481 yards and two TDs on 43 targets. He’s settled into a mid-teen player in most weeks with New England scoring about half of their TDs on the ground. His best game of the year came in Week 9 (5/130/1). CB Minkak Fitzpatrick continues to allow a low catch rate with short yards and no TDs, but the Patriots will test him if matched one-on-one with Gordon. Below par CB/WR matchup, but I sense a long TD with volume of chances. Alshon Jeffery (DK – $5,500/FD – $6,300): Jeffery has become the lost soul in the Eagles’ passing game over the last five weeks (4/35, 4/48, 4/33, 3/39, and 3/31) while receiving only 26 targets. Alshon looked great in three of his first four games (8/105/1, 8/74/2, and 7/88/1) in 2018 when he received 39 targets over four starts. The Cowboys held him to four catches for 48 yards in Week 10. Dallas has the top WR defense (127/1664/9 on 192 targets) in the league with three teams gaining over 200 yards (DET – 15/262/2, HOU – 17/217/1, and ATL – 13/206/1). The Eagles will try to get him away from top CB Byron Jones, but this still isn’t an exciting matchup. The talent to be in play at this level, but his minimal pulse of late isn’t worth a chase in the daily games in a tough matchup. Calvin Ridley (DK – $5,200/FD – $6,100): There has been more failure than upside in Ridley’s game over the last eight games (4/38, 3/37, 5/43, 3/37, 3/32, and 3/22), but he did shine in four games (7/146/3, 4/54/2, 6/71/1, and 8/93/1) in 2018. For the last two weeks, Calvin has been listed on the injury report with various injuries. On the year, he averages less than six targets per game with his best opportunity coming in Week 12 (13 targets) vs. the Saints. CB Jaire Alexander tends to play well in coverage, but he can miss some tackles. Weak play on the road (21/239/2 in five games) added to his health concern would keep me away. Tyrell Williams (DK – $4,600/FD – $5,800): Williams battled a quad injury over the last couple of weeks, which led to two short games (0/0 and 1/14). Since his two best games (3/118/2 and 4/118/1), Tyrell only caught nine of his 17 targets for 105 yards and one TD. In four of the last five games, he had WR2 snaps for the Chargers. Only a flash player with plenty of downside based on his four targets per game. Courtland Sutton (DK – $4,500/FD – $5,600): With Emmanuel Sanders out for the season, Sutton will take over as the WR1 for Denver. Over the last five games, Courtland caught 14 of his 26 targets for 312 yards and one TD. He’s never had over seven targets in a game while offering big play and scoring ability. His chances can’t help but move up, but a move to WR1 coverage won’t help his already low catch rate (47.4). The 49ers rank 22nd defending WRs (139/1971/19 on 226 targets). Both of San Fran’s outside CB have size, which will help slow down Sutton. Not a layup, but double-digit targets could increase his scoring potential tremendously. DeVante Parker (DK – $4,300/FD – $5,500): Parker had a decent game (4/43/1) last week, but he continues to battle a shoulder injury. Over the last five games, DeVante has 19 catches for 238 yards and one TD on 32 targets while receiving starting snaps in four games. The Patriots pushed their way to 12th in WR defense (155/1911/13 on 262 targets) after shutting down the Vikings’ WRs (17/127/1) last week. Parker tends to come up short in too many games, but his salary does give him a chance to surprise if Miami needs to throw. Josh Doctson (DK – $4,500/FD – $5,400): Doctson has 24 catches for 275 yards and two TDs on 37 targets over the last six games. Josh has doesn’t have a game with more than 70 yards receiving or more than six catches in a game while averaging only 5.5 targets per game. With a third-string QB starting in Washington, it’s even harder to believe in this boring player. Tyler Boyd (DK – $6,100/FD – $7,000): Boyd held his own over the last two games (7/85/1 and 6/97) while playing much of his time with backup QB Jeff Driskel. Tyler is on pace for 92 catches for 1,251 yards and eight TDs. The Chargers struggled vs. the Steelers’ WRs (45.20 Fantasy points in PPR leagues) in Wek 13, but they still rank 7th in the NFL defending WRs (138/1766/12 on 211 targets) with seven teams scoring fewer than 20.0 Fantasy points. Their two poor games vs. WRs came in Week 1 (KC – 12/206/3) and Week 3 (LAR – 21/265/3). CB Desmond King ranks highly in coverage while spending most of his time in slot coverage. Easy avoid with the Bengals playing with a backup QB and the Chargers expected to clock the clock with the run game. Antonio Brown (DK – $9,000/FD – $8,800): Brown had his best game of the year in Week 13 (10/154/1) while receiving 13 targets for the third straight game. Antonio has 12 TDs in 2018 with 11 coming in his last ten games. On the year, he averages 11.3 targets per game with four games with over 100 yards receiving. WRs have 116 catches for 1,678 yards and 17 TDs on 202 targets against the Raiders with no WR gaining over 100 yards receiving. Both of the Raiders’ top two CBs allow a low completion rate with some risk at times in big plays. His TD run should continues while lacking the needed volume of chances to post a score high enough to fill his salary bucket. Odell Beckham (DK – $8,300/FD – $8,000): Over the last four games, Beckham only has 16 catches for 267 yards with a poor catch rate (48.5), but he did score four TDs. Over first eight games, Odell gained over 100 yards in five games with six games with seven catches or more. The Redskins didn’t allow him to score in Week 8 while catching eight of his 11 targets for 136 yards. He averages 10.3 targets per game. Washington ranks 28th defending WRs (165/2305/15 on 242 targets) with six of the last nine opponents gaining over 200 yards at WR (NO – 14/273/2, DAL – 15/211/1, NYG – 16/218, ATL – 17/237/2, TB – 17/274, and DAL – 13/233/2). CB Josh Norman continues to underachieve in coverage while allowing too many big plays with risk in TDs. Beckham looks due, but he is still at the mercy of Eli Manning who needs his offensive line to block much better than their previous matchup (seven sacks). JuJu Smith-Schuster (DK – $8,200/FD – $7,500): Smith-Schuster was the odd man out in the Steelers’ passing game (6/49 on nine targets) last week after delivering three good games (3/90/1, 8/104, and 13/189/1). JuJu has over 100 yards receiving in five games while scoring only four TDs in the year. He’s been a road warrior in 2018 (49/717/1 on 65 targets) while being a much weaker play at home (34/387/3 on 54 targets) while playing the same number of games (6). CB Daryl Worley is the weakest link at CB with risk in TDs allowed. If given a choice between the top two WRs in Pittsburgh, Smith-Schuster would be my better choice in Week 14. JuJu will need a TD as he may lack the volume needed to post an impact game if the Raiders struggles to push the issue on the scoreboard. Julio Jones (DK – $7,900/FD – $8,400): After his six-game streak with 100 yards or more receiving, Jones failed to get open against the Ravens (two catches for 18 yards on eight targets). Over his previous eight games, Julio caught 64 of 91 targets for 976 yards and three TDs. One of the best games of his career (11/259/1) came in 2014 in Green Bay. The Packers sits 23rd defending the WR position (146/1980/16 on 243 targets) with three teams gaining over 200 yards (MIN – 23/282/4, NE – 14/231/1, and MIN – 18/219/2). The Packers have some injuries at CB, which invites upside for Jones. Possible another 100+ yards receiving, but questionable value in scoring. If the Falcons can pass block, Ryan will find him open in the secondary. Mike Evans (DK – $7,500/FD – $7,700): Over the last four games, Evans only has 27 targets. Mike has six games with over 100 yards receiving (7/147/1, 6/137/1, 7/107, 6/179/1, 6/120/1, and 6/116) with the first game coming in Week 1 against the Saints. His two biggest struggles (1/16 and 4/48) over the last five weeks both came against the Panthers. Mike averages 8.75 targets per game, which is well below his 2016 opportunity (10.8 per game). The Saints still rank last defending WRs (190/2632/17 on 262 targets) with four teams gaining over 200 yards (ATL – 17/285/4, BAL – 16/237/1, MIN – 21/246/2, and CIn – 16/274/2) plus two other teams gained over 300 yards (TB – 18/361/4 and ATL – 24/320/1). CB Marshon Lattimore will face Evans on most plays, but his game isn’t where it was in 2017. If Tampa pass blocks, Evans will have some chances in this matchup. A chaser game should work in his favor as well. Keenan Allen (DK – $7,400/FD – $7,900): Allen has a TD in four straight games with his best showing coming last week (14/147/1) when he received 19 targets in a chaser game. From Week 2 to Week 7, Keenan had 33 catches for 398 yards on 45 targets with no TDs. His opportunity and success were much better over the last five games (42/490/4 on 57 targets). Cinci ranks 21st vs. WRs (138/1766/12 on 211 targets) with three teams gaining over 200 yards (KC – 12/206/3, LAR – 21/265/3, and PIT – 18/212/1). The Chargers will run the ball a ton this week, which does invite much lower chances for Allen in the passing game. Playing well with a winnable matchup while his salary is favorable. Torn. Julian Edelman (DK – $7,100/FD – $6,900): The Vikings held Edelman to three catches for 60 yards last week on five targets, which came after a nice four-game run (28/363/1 on 37 targets). His success over eight games projected over a full season would come to 94 catches for 1,070 yards and six TDs on 138 targets. Miami is 11th in the NFL against WRs (137/1908/12on 217 targets) with five teams gaining over 200 yards against the WR position (NYJ – 15/202, OAK – 12/231/1, CHI – 11/203/2, HOU – 11/206/3, and IND – 14/217). CB Bobby McCain will give up catches while making some mistakes in TDs. A rebound game with a potential TD, but his salary would need much more production to be in play. 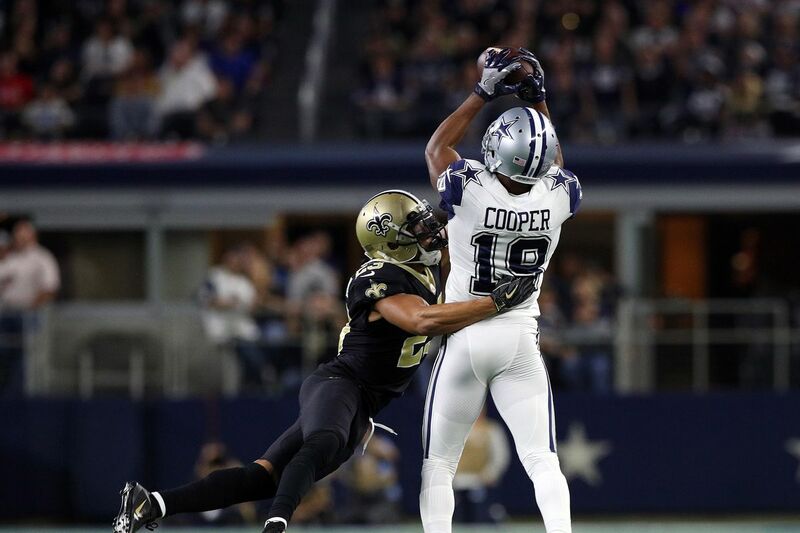 Amari Cooper (DK – $6,600/FD – $6,900): Over the last five games with the Cowboys, Cooper has 30 catches for 425 yards and three TDs in 40 targets (eight per game). His best three games came in Week 2 (10/116), Week 4 (8/128/1), and Week 12 (8/180/2). He’s on pace for 76 catches for 1,025 yards with six TDs if he played 16 games. The Eagles held him to six catches for 75 yards on ten targets in Week 10. Philly allows the second-most Fantasy points to WRs (178/2304/12 om 270 targets), but they haven’t been punished over the last couple of games by WRs after suffering some injuries at CB. An interesting player as he won’t be attractive based his salary and Fantasy owners gravitating toward Ezekiel Elliott. T.Y. Hilton (DK – $6,300/FD – $7,600): Hilton played well in his last three games (9/155/2, 7/125, and 8/77) while receiving 32 combined targets. In Week 4, T.Y. had four catches for 115 yards on six targets against Houston. The Texans are 9th against WRs (147/1905/8 on 234 targets). They struggled to defend the Colts’ WRs in Week 4 (25/344/1) and struggled last week against the Browns (16/277/1). Houston hasn’t allowed more than one TD to any team at WR in 2018. Both of the Texans’ two outside CBs will struggle with Hilton’s speed and quickness plus T.Y. has a winning history in this matchup. His only negative is a possible shoulder injury that kept him out of practice on Wednesday and Thursday. In my thought, if he goes through a full practice on Friday. Jarvis Landry (DK – $5,800/FD – $5,800): A chaser game helped Landry deliver his best game (6/103 on nine targets) since Week 7 (10/97/1). Jarvis still needs a push to reach 100 catches and over 1,000 yards (on pace for 88 catches for 977 yards and three TDs). He averages ten targets per game with two other games of value (7/106 and 8/103). The Panthers fell to 25th in WR defense (161/2172/14 on 253 targets) after allowing over 200 yards to WRs in three of the last four games (PIT – 12/226/2, SEA – 15/268/2, and TB – 12/210/2). Carolina will allow catches to slot WRs while limiting the damage in yards. Possession type WR who lost his scoring ability in the Browns’ offense. Game flow must slant his way to be in play. D.J. Moore (DK – $5,700/FD – $6,300): Moore is batting .500 over his last six games (29/418/1 on 38 targets) with three short games (1/16, 4/20, and 4/44) and three nice games (129 combined yards with five catches, 7/157/1, and 8/91). Over this span, D.J. averages 6.3 targets per game while receiving starting WR snaps in each game. The Browns ranks 27th defending WRs (172/2151/12 on 286 targets). CB Denzel Ward would be a tough matchup, but he’s trending toward not playing. Upside talent who looks overpriced for his targets while having the ability to surprise if the Panthers needed to pass. Larry Fitzgerald (DK – $4,900/FD – $6,200): Over the last three games, Fitzgerald only received 12 combined targets leading to three small games (2/23/2, 2/30/1, and 3/48) in catches and yards. In his last six games, Larry has 25 catches for 29 yards and five TDs on 42 targets. Detroit can be hot and cold defending WRs (129/1955/16 on 193 targets). They failed vs. WRs in three games (GB – 19/297/2, CHI – 11/255/3, and CAR – 17/291/2). CB Nevin Lawson hasn’t played well in 2018 due to risk in TDs allowed, but he will keep most of the catches against him to short yards. Maybe home cooking helps his value and the injury to Christian Kirk may push more targets back his way. Golden Tate (DK – $4,800/FD – $5,700): Over the last three games with Philly, Tate has 16 catches for 163 yards and one TD on 23 targets. The Eagles had him on the field for 48 percent of their plays last week, which was a drop off from the two previous games (71 and 60 percent). The Cowboys’ weakest CB covers the slot, which gives Golden a chance to be active if Philly needs to throw. About an eight target a game guy with some value in TDs. Tough call with the Eagles having so many options in the passing game while having a tough passing matchup. Devin Funchess (DK – $4,700/FD – $5,400): Last week Funchess caught both of his targets for TDs, but one was called back due to a penalty. The Panthers had him on the field for only 46 percent of their plays. Not quite healthy while needing more playing time to be considered at this level. Tre’Quan Smith (DK – $4,500/FD – $5,700): After his breakout game (10/157/1), Smith turned in a did not play and zero in Week 13 when he had one target while receiving WR2 snaps. On the year, Tre’Quan has three catches or fewer every other game while having one other game of value (3/111/2). Tampa has risk everywhere in their secondary, which gives Smith a chance at a productive game. Makes the most sense if tied to Drew Brees. Risk/reward player with homerun ability. Marquez Valdes-Scantling (DK – $4,400/FD – $4,900): After playing well over four games (7/68/1, 3/103, 2/45/1, and 3/103), Valdes-Scantling shot blanks over his last three games (1/8, 1/3, and 2/19) on 12 targets. The Packers continue to give him WR2 snaps, which makes him a live value play with Aaron Rodgers throwing him the ball. CB Brian Poole will try to keep him close to the line of scrimmage, but Marquez has the speed to beat him in the deep passing game. Viable flier as he’s long overdue for a good game and the change of coaching staff may help his value. Dante Pettis (DK – $4,400/FD – $5,500): Pettis was the low-value WR to own in Week 13 (5/129/2) while giving a tell in Week 12 (4/77/1). Dante has starting snaps in back-to-back games while showing playmaking ability over his last two seasons at Washington (53/822/15 and 63/761/7). The Broncos lost the best CB last week, but he wouldn’t cover Pettis on the outside. Denver ranks 20th defending WRs (163/2073/13 on 249 targets) with one team having an impact game (PIT – 28/323/1). Best WR on the team, but Marquise Goodwin should play this week cutting into his low number targets. Michael Crabtree (DK – $4,300/FD – $5,200): Over the last three games, the Ravens have only attempted 70 passes leading to 485 yards and one passing TD. Their downgrade in completions (14 per game) over this span has killed Baltimore’s WRs. Crabtree has three catches or fewer in five straight games while failing to gain over 40 yards in each contest. He did score his three TDs via Lamar Jackson in Week 12. The Chiefs have worked their way to 17th in WR defense (173/2083/10 on 295 targets. The Ravens will need to throw this week while their best success may be Joe Flacco coming off the bench. Boring path, but his matchup does give him a chance at a mid-teen score. Zay Jones (DK – $4,200/FD – $5,100): Jones played well in two of his last three games (8/93/1 and 4/67/2) with a combined 20 targets, but he did toss in a zero in Week 12 on one target. With Kelvin Benjamin no longer on the roster, Zay will continue to be the top receiving target. Even with a bump in success of late, Buffalo passed for fewer than 200 yards in eight of their games in 2018. The Jets allow the third-most Fantasy points to WRs (172/2274/13 on 280 targets). Possession type WR who has a developing connection with Josh Allen. Possible follow through. John Brown (DK – $4,200/FD – $4,600): Brown went from early season hero (3/44/1, 4/92/1, 5/86, 3/116/1, and 7/134/1) to literary a zero in Week 13 (no catches on four targets). Over his previous four games, John caught only eight of his 21 targets for 91 yards. Tough sell, but game flow may lead to a bounce back in value if he hits on a long TD. Jordy Nelson (DK – $4,200/FD – $5,000): After battling an injury in Week 6, Nelson went over a five-game stretch with only five catches for 36 yards and no TDs on 12 targets. With Oakland forced to throw last week, Jordy had a season-high 11 targets leading to ten catches for 97 yards. His only other game of value came in Week 3 (6/173/1). The Steelers are league average against WRs (162/1999/14 on 260 targets). Similar situation last week, but the Steelers have a much better pass rush (41 sacks). WR1 for a QB who can makes plays if he has time to throw. More a gamble for a Fantasy owner that is a week late to the dance. Demaryius Thomas ($4,100/FD – $5,400): Thomas continues to be more trick than treat even in Denver. In his four games with the Texans, Demaryius has ten catches for 131 yards and two TDs on 14 targets highlighted by his game in Week 12 (4/38/2). The Texans continue to win games while playing from the lead, which gives him questionable chances. Priced low to be in the mix at this level if Houston needs to air the ball out. Curtis Samuel (DK – $4,000/FD – $5,700): Samuel fell short of an impact game, but he did his part. He finished with eight catches for 93 yards while just missing a TD when a defender made a nice play in the end zone. Cam Newton also underthrew him on a possible long TD. His final failed piece came as a result of two Ints in the fourth quarter by Newton. Over the last two games, the Panthers had him on the field for WR2 snaps with Devin Funchess injured. Playmaker with scoring ability (five TDs in his last eight games), but his targets remains low in most games while expecting to get starting snaps again this week. Antonio Callaway (DK – 3,900/FD – $5,400): Callaway caught three of his six targets last week for 84 yards while having an 80-yard TD called back by a penalty plus fumbling a long TD near the goal line. Over his last five games, Antonio caught 17 of his 24 passes for 272 yards and two TDs. Improving, but Cleveland only gives him about five targets per game. Boom or bust swing.